Localised information and a simplified interface provide you with good asset knowledge. Localised information By gathering together graphical information and information on surfaces, equipment and people, Planoteam enables our customers to form their asset repository. 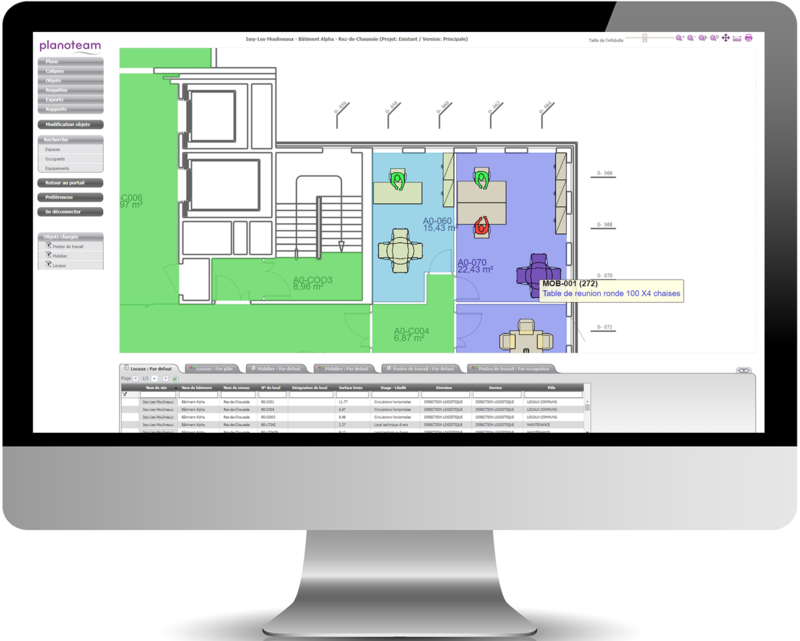 Simplified interface Without the need for CAD software, everyone can access the information they require graphically: occupants, surfaces, furniture, network equipment, etc. Planoteam allows you to integrate CAD drawings and obtain thematic plans, facilitating access to data. Integration of CAD drawings Thanks to its add-on for AutoCAD, Planoteam integrates your CAD drawings and extracts the surface and equipment information, which is then integrated in the spatial database. Function of thematic plans By combining the drawings and the information taken from other bricks of the information system (directories, equipment lists, CMMS, etc. ), you can obtain a graphical representation of the data: plan of the surface areas by department, colour-coding of fire extinguishers by maintenance date, office by occupation rate, etc. Costs are optimised via single-click dashboards and simplified relocations and office moves. 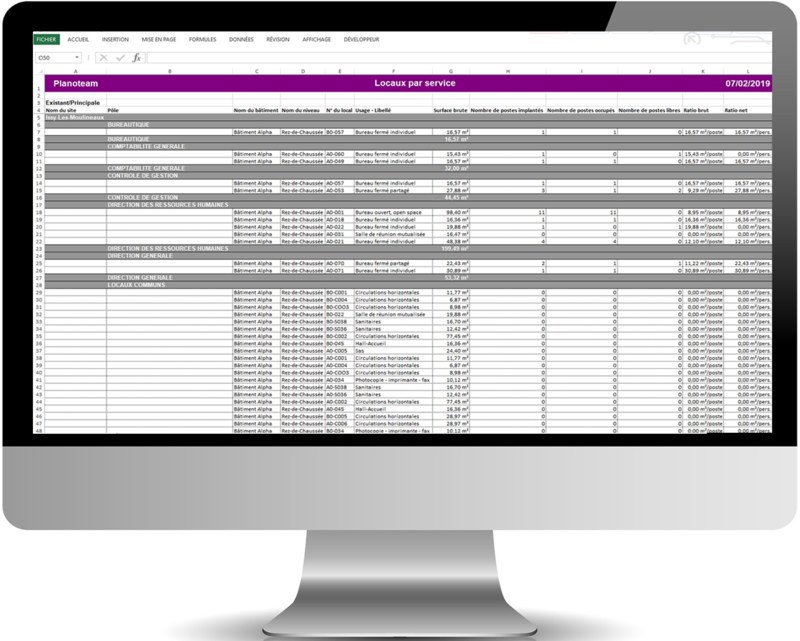 Single-click dashboards Lists, ratios, surface area tables by department or by use: you can extract all the information you need from the database to manage your buildings on a day-to-day basis. 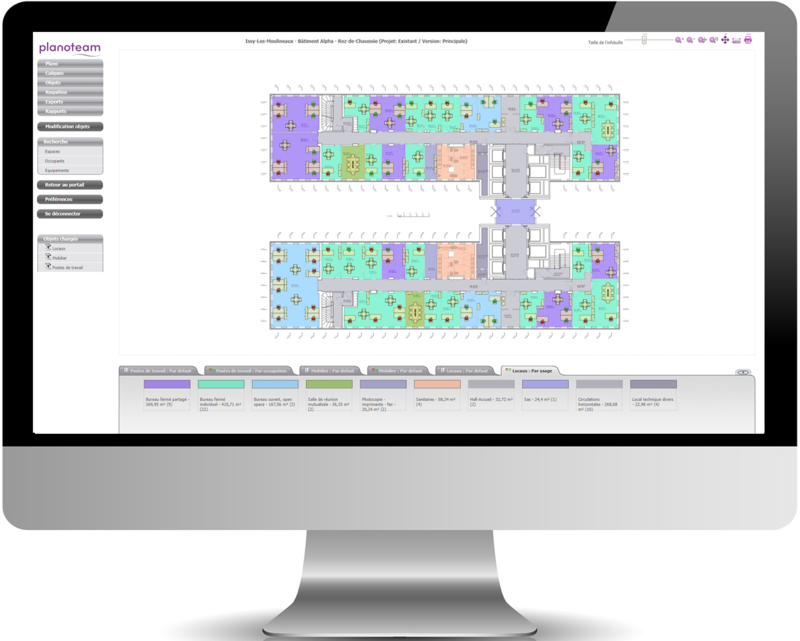 Simplified relocations and office moves Thanks to the relocations module, you can optimise the space needed to group together departments and obtain precise list of the users, furniture and equipment to be moved. Mezzoteam BIM provides you with a single collaboration platform, where each user may access the model simply and directly via their web browser.